To make greater returns on your peer to peer lending you should consider monthly subscriptions. EstateGuru explains how they can offer even greater returns. Peer to peer lending is known to make exceptional returns on your investments. But there is a way to ensure that your long-term investments do even better – monthly subscriptions. Whilst peer to peer lending can provide shorter returns on your investments, should you wish to create a nice sum for your children’s future – maybe university fees, or a deposit for their first property? But how do you build up this lump sum? The calculations have been made from the average interest received from funded loans- 10.91%. Should the calculations be based on the average historical interest received from returned loans, then the returns would be even greater. Quite easily – either set up a bank transfer for the amount each month to your virtual account or even easier, switch on EstateGuru’s Auto Invest feature and never miss an investment! This way your small invested amounts continue to build greater returns without interruption. You can read how to use the Auto Invest here. 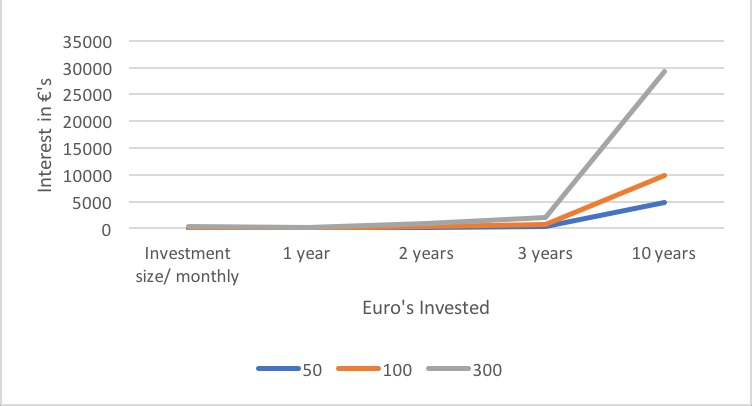 To conclude, to obtain greater returns from your peer to peer lending you should consider two things: 1) plan for the long term (whether this will be a dream holiday, a pension plan or children’s inheritance); and 2) add investment amounts each month via monthly subscriptions. Even use Auto Invest to make the process fully automated. This way you can receive higher returns on your investments completely hassle-free. Trying to calculate interest receiving around 6%, not 10.91% as you described. How did you guys calculated please?